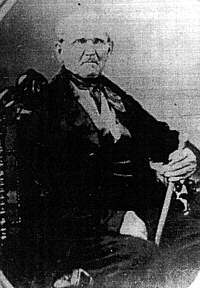 John Jordan, son of Francis Marion and Mary Ann Browning Jordan, married Eliza Jane Sadorus Jordan on March 24, 1832 in Champaign County, Illinois. A little over a year later they, along with Francis and others, moved to Texas. Eliza Jane's parents, Henry S. Sadorus and Mary Titus Sadorus were pioneer settlers in Sadorus Grove, Champaign County, Illinois. "It was not until April, 1824, that Henry Sadorus and Joe Smith divided the Sadorus Grove on the Kaskaskia. Sadorus built a half-faced camp or lean-to in the north half of the grove; Smith completed a 16 x 16 cabin in the south portion. Within less than a year, Smith decided the Peoria region was more attractive, and aided by Sadorus, continued on to the Illinois river. Smith offered his cabin in exchange for assistance in moving. This represents the first real estate transaction in the county. 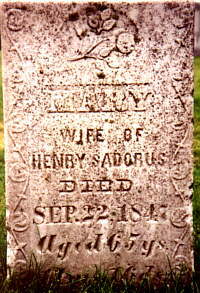 Both Fielder and Tompkins also deserted the county within a few years, so Henry Sadorus is credited as the area's first permanent settler". (Morgan). This obituary from the Champaign County Gazette gives a good description of Henry Sadorus and of his life:. 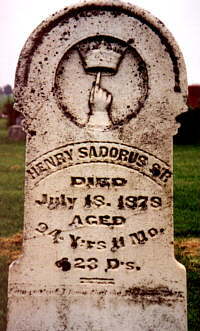 "Henry Sadorus.-There died, at his residence in sadorus, this county, at 6:15 o'clock on Thursday morning, July 18th, Henry Sadorus, one of the earliest if not the first, white settler of Champaign County. 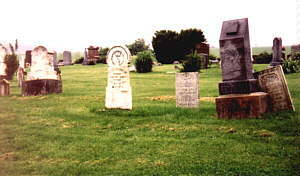 He was born in Bedford County, Pennsylvania, July 26, 1783, and died at the ripe age of 94 years, 11 months and 23 days. His funeral service was held in the Baptist church, in Sadorus, Friday afternoon. The sermon was preached by Rev. D. P. Bunn, a Universalist clergyman of Decatur, by request of the deceased. A large number of friends were present, including many of his associates from a distance. The last appearance of the old gentleman in public was at the 4th of July celebration, at Sadorus, upon which occasion he sang a song to please his old friends. On the evening of the 5th, he was taken violently ill with flux, which the physicians were unable to check, and which was the immediate cause of his death. He sank gradually and suffered greatly. He retained the use of his mind until within a few hours of his demise, when he sank into a comatose state. During the last years of his life he was able to read well, and at the time of his death was engaged in reading Mitchell's Astronomy of the Bible. For several years he has been quite deaf, which made it difficult to carry on a conversation with him. Mr. Sadorus was twice married. His first wife was Miss Mary Titus, whose ancestors lived near Titusville, Pa., and from whom that town was named. At the age of fifteen, Mr. Sadorus moved with his parents to Somerset County, Pa., and there spent several years in the peaceful pursuit of agriculture. Later he worked in Canada and finally located in Cincinnati. While living in the latter place he became possessed of a desire to travel and see something of the world, and visited New Orleans, travelling by flat-boat. From New Orleans he crossed the Gulf of Mexico to Cuba, and thence to Baltimore, whence he returned overland to his native town. He soon after married. On the breaking out of the War of 1812 he enlisted as a private soldier and served as such for about a year. A few years ago he applied for a pension, and was, we believe, recently granted one. Some time about 1818 Mr. Sadorus and his young family emigrated to Flat Rock, Rush County, Ind., and while there made several profitable trades, which supplied him with, for those times, quite a capital. In 1824, having disposed of his property in Indiana, he started west with his family, then consisting of his wife and six children, the oldest a lad of about fourteen, in a prairie schooner drawn by five yoke of steers. Whether he had any definite destination fixed at starting the writer does not know, probably not, but on arriving at what is now known as Sadorus Grove, he concluded to stop. The nearest neighbor to the east was Jacob Vance, at Butler's point, in what is now Vermillion County, from which place most of the salt was procured that was used by the early settlers in this section. His nearest neighbor was James A. Piatt, fifteen miles northwest, where Monticello now stands. In 1834 Mr. William rock settled two and a half miles further south, and neighbors began to crowd closely. The state road from Kaskaskia having been opened and passing near his residence, Mr. Sadorus decided to erect a building for a tavern. The nearest sawmill was at Covington, Ind., sixty miles away, but the lumber, some fifty thousand feet, was hauled through unbridged sloughs and streams and the house was built. For many years Mr. Sadorus did a thrifty business. His corn was disposed of to drovers who passed his place with herds of cattle for the east, besides feeding great numbers of hogs on his farm. His first orchard, now mostly dead, consisted of fifty Milams, procured somewhere near Terre Haute, Ind. From them were taken innumerable sprouts, and the apple became very common in this section. In common with all the pioneers, Mr. Sadorus grew his own cotton, at least enough for clothing and bedding. a half-acre sufficed for this, and the custom, was kept up until it became no longer profitable, the time of the mother and three daughters being so much occupied in waiting upon and cooking for travelers, that they could not weave; besides, goods began to get cheaper and nearly every immigrant had some kind of cloth to dispose of. About the year 1846 Mrs. Sadorus died and seven years later he again married, this time a Mrs. Eliza Canterbury, of Charleston. On the breaking out of the California gold-fever, three of Mr. Sadorus's sons and a married daughter started overland for the auriferous regions. Two of his sons, we believe, now live in Sadorus, and were present at his death-bed. Some years ago, becoming tired of attending to so much business, Mr. Sadorus divided his property among his descendants, retaining, however, and interest which enabled him to pass his declining years in ease. He died full of years, respected by all who knew him, and beloved by a large circle of friends. He was kind and hospitable to strangers and never turned a needy man away empty-handed from his door. Thus has passed away one of the old landmarks of the county, one whose life teaches valuable lessons and whose industry, frugality and good example should be emulated by all. What he has done others may do. His life of late years has been one of peace and quiet; his early days were passed in what, in modern times, would be called poverty and privation; yet no one doubts that they were days fraught with happiness and years rewarded by plenty. His own hands felled the trees from which his first cabin was made; his wife and daughters spun and wove the wool and cotton which supplied them with raiment. Carriages, carpets, fashionable furniture and the luxuries of today were unknown, yes, unheard of; yet contentedly the pioneers bore their burdens and grieved not for the things they knew not of. There are many interesting reminiscences connected with the life of Mr. Sadorus, but we must leave them to the historian who, at some future time, may write the history of the lives of the early settlers of this county"(Obituary).